The Company’s four citrus orchards, located in South Australia’s Riverland region, enable marketing of fresh fruit varieties over extended seasons. The region is recognised as a clean growing environment with ideal climatic conditions and soil types for quality fruit production. 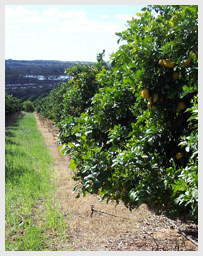 Extensive areas of plantings include Navel Oranges (Navelina, Washingtons and Lanes), Imperial Mandarins, Tahitian Limes, Eureka Lemons, and Kaffir Limes and Lime Leaves, which have meant the Company has positioned itself as a producer of the newest varieties of citrus. The Company’s reliance on the natural environment of the River Murray has led it to adopt specific, sustainable environmental practices. The orchard management systems incorporate the latest production technology, environmentally responsible irrigation practices and minimal chemical use.